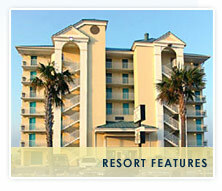 Beach Tower Resort is family owned and operated. As owners, we are involved in every aspect of the motel. We are there to ensure that your vacation is just that--a vacation. A time for your family to relax, unwind and enjoy our beautiful beaches. Beach Tower Resort is located directly across the street from Shipwreck Island Water Park. The park has over 25 rides and attractions for the whole family to enjoy! Check out Rock'It Lanes for some of the best entertainment on Panama City Beach. We are also within walking distance to shopping, restaurants, motorcycle rentals, great nightlife, and the County Pier! We have floorplans to suit any need. Our rooms are all Gulf front with private balconies. For a closer look at the units and the motel, check out our Virtual Tours of the Property. Most important--they're clean. Our motel was built in 1998, and we pride ourselves in providing you with a clean, comfortable place to enjoy the beach.